When you really think about it, the key is sort of an archaic thing. It’s just a shaped piece of metal that interacts with other pieces of metal to secure our doors, desks, cars and other important stuff. These three awesome inventions could make that archaic bit of metal totally obsolete. 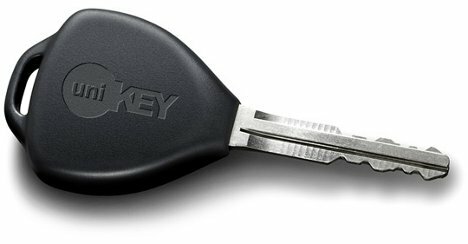 The UniKey is an app and a dedicated lock that offers unprecedented flexibility and freedom. 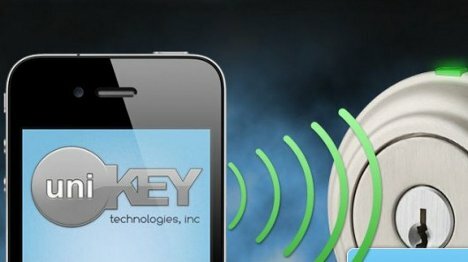 Instead of carrying around a key, the lock opens with an app on your iPhone, Blackberry or Android phone. The lock gets the signal from your phone as you approach, then all you have to do is touch the lock to open it. Temporary codes can be created for visiting friends, then deactivated when their visit is over. Visitor codes can even be set to work only at certain times or on certain days, and any keys given out can be revoked at any time. The special lock also comes with a physical key just in case you get home and find your phone is dead. And if you don’t have a smartphone at all, a Bluetooth fob – kind of like the one that unlocks your car doors – can be used instead. Grabit works without the need to carry anything extra at all. 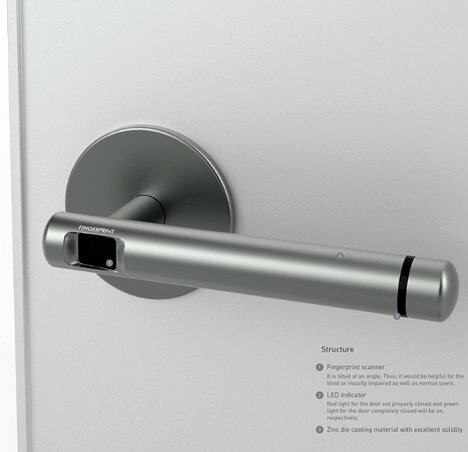 It is a door handle that incorporates a fingerprint scanner, but in a slightly different – and much improved – manner compared to existing fingerprint scanning door locks. 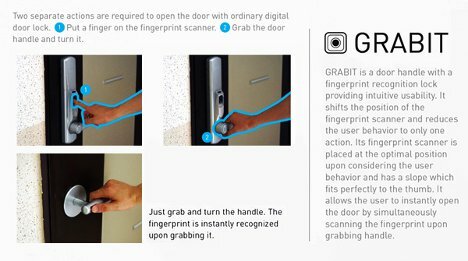 Instead of holding up a finger to be scanned and then reaching down to open the door, the Grabit lets you open the door in one fluid movement by placing the scanner on the handle itself. You grab the handle in a natural motion and it reads your fingerprint, then instantly unlocks for you. An AT&T Labs concept would use the human body itself to open locked doors. 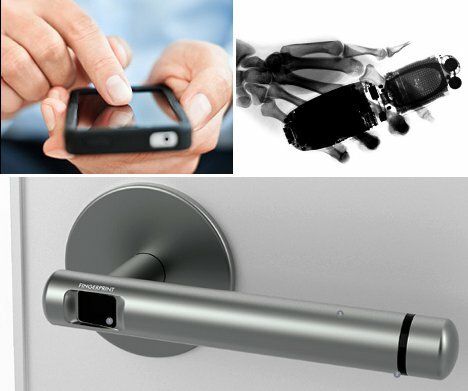 The system would use piezoelectric transducers embedded in smartphones or wristwatches to communicate with receivers in door handles. The signal would be transmitted through the human skeleton itself. Due to differences in size and density, each skeleton would transmit signals differently – so if the right signal is transmitted through the right skeleton, the door will open like magic.